The best thing to do in Kinsale is, literally, to spend some time and explore this small County Cork town (just around 5,500 inhabitants) at your leisure. With sailboats in the harbor (Kinsale literally means “tide head”, and is located on the mouth of the river Bandon), colorful houses and narrow streets Kinsale is a town so “typically Irish” it almost hurts. Some critics dare to suggest that Kinsale is more akin to a Hollywood (or even Bollywood) idea of rural Ireland. But that is what the visitors want, after all, and most will not be disappointed. There is, however, no discussion about one thing: with its numerous restaurants, cafés, bars and pubs, Kinsale can lay a claim to being the culinary capital of Cork, and maybe even Ireland. The annual Kinsale Gourmet Festival in October is a fixed entry in many a aficionado’s calendar. On the other hand — to recommend a restaurant in Kinsale is an exercise in futility, as almost all are excellent. 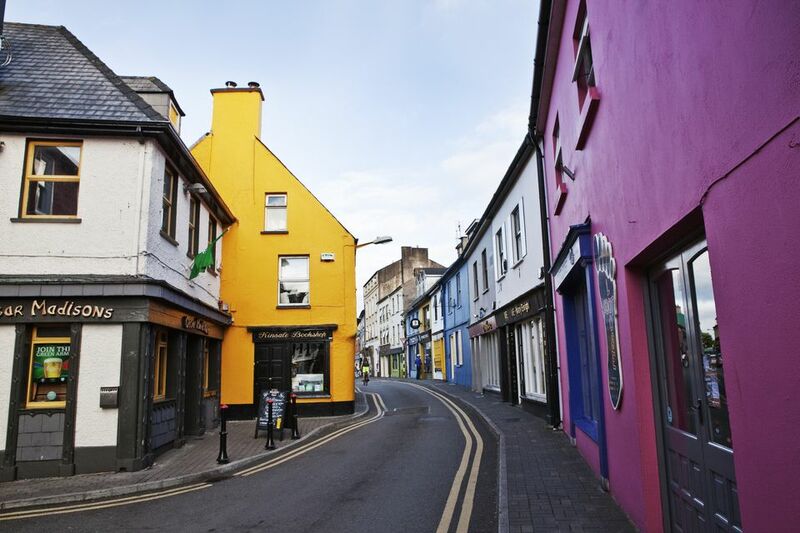 Thus the ultimately best thing to do in Kinsale is to start with a walk through town, and then a slow drift into any establishment that takes your fancy (or that you can afford, because one thing Kinsale certainly is not a budget-friendly destination). St. Multose Church originally was erected during around the year 1190 in the Norman style, but has been converted several times over the centuries. Especially of note are a portal in the Romanic style, and the graves from the 17th century. If you like your beer fresh and made by artisans, why not pay Black’s Brewery in Kinsale a visit? Opened only a few years ago, they have a shop and also provide brewery tours. Their beers come in a wide range from IPA to barley wine, and they also provide a very fine gin as well. You’ll find the brewery in Farm Lane, a bit outside the town center — just try the Eircode P17 XW70 in Google Maps for directions. Also known as the “French Prison”, this is a fortified house from the early 16th century, built by the Earl of Desmond – hence the name. In later years it was used as an armory, as a customs building, and as a jail. And when some French prisoners of war were incarcerated here during Napoleonic times, the building acquired its Gallic nickname. Today the still impressive building is host to a wine museum (international, an exhibition on Irish wine would be small), supported by local restaurateurs. One focus is the influence of Irish emigrants on the international wine trade. The Kinsale Regional Museum is housed in an old courthouse that's been preserved very much in the old style. And it is of historical importance — the inquest into deaths due to the sinking of RMS Lusitania in 1915 was held here. The museum highlights this tragic event, but its artifacts from the town’s history are more interesting when they border on the banal – like the large billboard from 1788, detailing the local taxes and excise duties. The traditional women’s dress on show — long, black and hooded — also has some curiosity value… Kinsale must have seemed like a monks’ retreat on rainy days. As noted above, recommending a restaurant in Kinsale is almost impossible… but if you really like your fish, head for Martin Shanahan’s restaurant “Fishy Fishy”. Not the cheapest option in town, but maybe one of, if not the, best for locally caught seafood. Look for the seafood chowder (€8 for a bowl) or the Fishy Fish pie (around €24). The Old Head of Kinsale, in view of which the RMS Lusitania was sunk by a German submarine, is around twenty minutes drive out of Kinsale proper — follow the R604 in a south-west direction. A small memorial to the Lusitania sinking can be found near a small parking lot and a ruined tower. Further on the way to the Old Head of Kinsale proper, marked by the lighthouse in the distance, is barred by security — the patrons of a private and exclusive golf course do not want to be disturbed. Still, the view is worth the drive! The annual Kinsale Gourmet Festival is the place to be if you want to experience the full frontal assault of Kinsale’s chefs (and guests) on your taste buds (and waistline). Definitely worth going if you know your food, and want to be wined and dined by some of Ireland’s best restaurants. Pencil in the mid-October weekend for this event. And bring an appetite. Two-day tickets (including food and drink) go for €175; single day: €95.